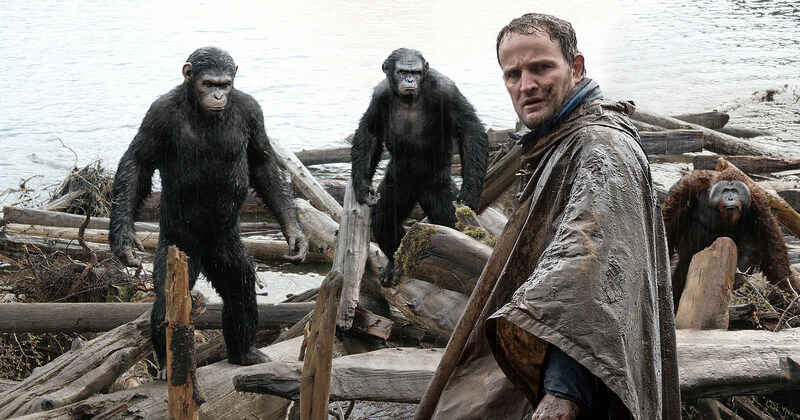 Short-Thanks to a worthwhile story, a fantastic cast, and absolutely fantastic direction from Matt Reeves Dawn of The Planet of The Apes is one of the better summer blockbusters of 2014. Dawn of The Planet of The Apes is an achievement in film making but also a show in superior motion capture, led by Andy Serkis. At the end of Rise of The Planet of The Apes, The sickness known as “The Simian Flu” is getting ready to spread. Dawn of The Planet of The Apes takes place 10 years later; the human race is on its way out and the group of genetically enhanced apes led by Caesar (Andy Serkis). The human contingent living in San Francisco is led by Malcolm (Jason Clarke) and Dreyfus (Gary Oldman). Malcolm leads a small group into the ape infested woods to get a dam up and running to supply power to the city. Within his group is his son Alexander (Kodi Smit-McPhee) and Ellie (Keri Russell) who is not his wife but his post-flu partner. From the start of the film Matt Reeves shows that there is no other way to go then war. The human ranks are filled with violent strong willed people, if Malcolm is looking for a peaceful resolution; Gary Oldman's Dreyfus is looking to eliminate the problem rather than solve it. The same lies on the side of the apes, Caesar is the leader but any sign of weakness could give his second in command Koba (Toby Kebbell) an opportunity to get revenge on humans for the experiments that left him disfigured. 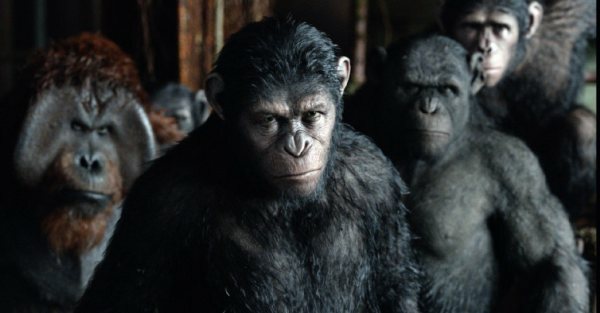 Dawn of The Planet of The Apes is as much a story about the apes as it is the humans, which when you have motion capture legend Andy Serkis leading the way the Apes become the more compelling of the two. If you were like me and considered The Lord of The Rings actor's Rise of The Planet of The Apes work as Oscar worthy then you can imagine little has changed in 2014's Dawn. Serkis embodies Caeser and the special effects leave little to the imagination. As far as the human actors go, Jason Clarke (Zero Dark Thirty) is skyrocketing the same way his Zero Dark Thirty Co-Star Chris Pratt is. Clarke is a talented actor and his performance as Malcolm lets him let loose on some of those talents but it is not as layered as the one in Zero Dark. Clarke will star in Terminator: Genesis next year and is also set to appear later this year in Terence Malik's Knight of Cups. Gary OIdman is as usual great if not underutilized. Set up as the movies villain, instead Oldman is just a reactionary attempting to survive at any cost. He doesn't generate a relationship with Caesar like Malcolm and because of that his screen time is only when the humans are under attack or scenes in San Francisco. Keri Russell ironically was cast as the female lead, being that Matt Reeves was the co-creator of Felicity, her star making TV role which lasted from 1998-2002. Russell is good, but again she isn't given a heck of a lot to do so she can't really show off the chops she has brought to her recent job at FX's The Americans. Dawn of The Planet of The Apes is a well-constructed sequel that doesn't fool around, it's brave storytelling considering unlike most sequels it is a continuation of the Apes story while clinging on to a separate human cast. Reeve's camera captures the raw emotion of both groups and the script by Amanda Silver, Rick Jaffa, and Mark Bomback develops the characters while also moving the films plot toward the war we all know is coming. You also must take your hat off to the hard workers at Weta Digital that did the special effects, the effects are gorgeous and the apes continue to look incredibly real. Yes the performances are fantastic and Serkis has become a master of his craft yet it’s the FX artists that make everything including CG animals look fantastic. (SMALL PLOT DETAILS AHEAD) There is inevitability to the film’s final act but the story is less about why we get there and more about how. We know the relationship between humans and apes is too strained. Very quickly we see that both sides react too hastily in fear of one another and war is the inevitable product of that. Only Malcolm and Caesar attempt to prevent fighting early but once the fighting begins it doesn't seem to make much of a difference. Dawn of the Planet of the Apes success should green light a third film and for a franchise that gets more and more exciting a sequel is not a bad thing. My name is George and I'd like to know if you would have some interest to have your website here at teamprocreate.com promoted as a resource on our blog georgemartjr.com ? Starring- Jason Clarke, Andy Serkis, Keri Russell, Gary Oldman, Kodi-Smit McPhee,Toby Kebbell, Kirk Acevedo, Judy Greer, Jon Eyez and Enrique Murciano.